Developers get ready for Mango! In Windows Phone Mango, Microsoft has made a lot of changes, all based on our prime directive of delivering outstanding end users experiences, and making it easier for you to deliver outstanding end user experiences. Change comes at a cost. As documented on the Windows Phone Team Blog, there are some instances in which applications for Windows Phone may exhibit undesirable behaviour in Windows Phone Mango. Please download the latest Windows Phone SDK beta, and test your application, and submit it the MarketPlace Mango ready. Windows Phone Mango brings a large set of new features for developers! One of the most exciting is Fast Application Switching, (FAS), which will radically improve the user's experience of your application when using the new task switcher in Windows Phone. 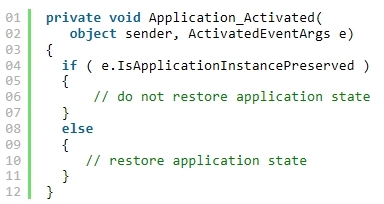 In many cases, adding this to your app will be as easy as modifying your Application_Activated event handler to only restore state when coming back from Tombstoning, (as opposed to coming back from the new Dormant state). We've published the details of our new execution model in Mango in the MSDN Library, and we've also published a useful 10 minute video walk through detailing how to leverage these concepts in your code, here. There's a lot more to Mango for Windows Phone developers. In the coming weeks we'll be publishing a lot more detail online about how to add Mango functionality to your existing applications. We've already started this process, and have a lot of material available for you today. See Larry Lieberman, twitter: @LarryALieberman Windows Phone Team Blog post for detail on all of our available online resources about executing on Mango features today in your Windows Phone applications and games. As we drive towards the launch of Windows Phone Mango, we're looking for apps that showcase the new features of Mango; we'd love to be able to feature your work, both online, and on stage. Feel free to contact us if you are interested in this opportunity.